After years and years of planning, my friends and I finally got to do it! We finally got to make our Hong Kong vacation a reality. We have been planning this trip for more or less four years. A lot of tiny bumps arose and the destination kept changing but nevertheless, we finally got to do it. DAY 1. We arrived in Hong Kong late in the afternoon. It didn’t leave us enough time to do much but enough time to catch something so magical. As soon as we landed we were driven to the Hollywood Hotel in Disneyland. Before we could even explore our own room we are out the door and straight to the theme park. There wasn’t much to do anymore since it was slowly getting dark. We still decided to go and catch the night parade and fireworks display. It is not my first time in Disneyland Hong Kong. This trip is my second however, I only caught the parade during the morning before. The night parade was so fun with all the pretty lights and the characters. I felt like I was a kid all over again. The highlight of the parade for me was definitely Belle from Beauty and the Beast. She was so pretty and elegant looking. After the parade, everyone moved to face the castle. In anticipation, everyone waited for the fireworks display to begin. I am not gonna lie, I was anxious throughout the whole waiting process. I am not very fond of fireworks. They scare the living crap out of me, but that was not the case this time. As soon as the fireworks began, I found myself silent. Mostly, because I was trying to calm my nerves. Moments after, I realized I was captivated by the beauty of it all. I know I’m 20 years old but the whole show made me cry. Not because I was scared I was gonna die but because it was so beautiful and nostalgic. DAY 2. The next day, that’s when we decided to actually go in the theme park and enjoy ourselves. Sadly, it was a very very hot day. We still tried to enjoy all the rides and dodge the sun. I was starting to sense that I was a tad bit too old for all the walking. I felt beaten up afterward. Towards the end, we decided that we would just do the walks where we could meet characters. Seeing Elsa and Anna was the goal. Again, sadly, they were a no show. But we did see Eeyore. Everything was great about meeting him until he decided not to let go of me. Honestly, everything happened so quickly that I didn’t even know how I got into the position. Next thing I know I was trying (very hard) to pull away from him but I couldn’t. I decided to just give him want he wants. I just stood there. He then forced me to take a photo with a family I don’t even know. After that photo, he finally let me go. Later that night, we moved to the next hotel in Kowloon. We settled in nice and cozy in the hotel, had dinner and went to bed. We were knackered from Disneyland. DAY 3. The next day, we had to commute from our hotel to Mongkok. At first, it was a bit of a challenge. We were getting confused and the lack of street signs wasn’t helping but we eventually got the hang of it. We went to a street bazaar called Ladies Market. The same as the day before, it was very hot. We weren’t under direct sunlight but it still felt as if we were in an oven. We all still managed to do a bit of shopping despite it. I manage to get some small gifts for my family and also get myself a pair of palazzo pants. I never thought I’d look good in them. Now that I’ve tried them, I love them. DAY 4. The day after we went to Hong Kong Ocean Park. We didn’t get to go on any rides but we did see loads of animals. We saw different kinds of fishes, seals, dolphins, arctic foxes, penguins, monkeys, and a giant panda. I was so excited to see the panda. They look so fun and cute on the internet. In reality, they are still cute but they are kind of boring. In the five minutes I spent watching one, it didn’t do anything but sit and eat. I guess that’s their charm. We watched a show where sea lions and dolphins were the stars. I had just received a terrible news from home right before the show but it managed to cheer me up a bit. They were very cute and smart creatures. The only problem I had with the park was that there was a lot of walking involved. What made it worse is that, since the park is on a mountain there were a lot of going ups and downs. I really felt as if I was working out. I felt the burn while I was walking. DAY 5. The next day was another round of shopping. This time we were in Cental and a bit of Causeway Bay. We went up a giant slope only to find out it was for nothing. The cafe we wanted to go to was closed during that day. Despite that, the walk up was along an outdoor market that sells vegetables and fruits. As we went through it, I couldn’t help but look at the fresh produce. They were all so big and fat. I honestly wanted to just stop at one point and sit there to eat. The walk up the slope ended up good. We found an old candy shop called Mr. Simms. I felt as if I was in heaven. There were so many sweets and chocolates that I had to buy some. It was amazing. The people in the store were also very nice and accommodating. They even took our photos for us. They also took them in different angles for us to choose from. We also went to a book shop named Flow Books. Sadly it was closing down and they were giving away some free books. We decided to take some for ourselves. We took some time going through the books. It was like a hidden treasure. We decided to donate a small amount of money since they plan on reopening the shop. They just needed more funds. Day 6. Another day, another destination. We went on a little tour of the Hong Kong islands for our second to the last day. We actually didn’t know it was a tour but it was good. We went to temples and the Victora Peak. The view was beautiful. One one side you can see nature and on the other, you see the city. It was a beautiful balance. After the tour was another round of shopping. We didn’t buy much in during that time. Although when we got back from the tour, we still had enough time to go to another island so that’s what we did. We ended up going to two more islands. It was tiring but it was worth it. Also, the weather was kind of good and it wasn’t super hot. DAY 7. The last day of the trip was spent doing some little last minute shopping and eating good food. I manage to finish buying all my gifts and tiny treats for myself. We went to tiny grocery stores trying to finish our coins and the money left in our train cards. We also tried street food. It was okay. Nothing I went crazy for or I’d go out of my way to buy but it was an experience. 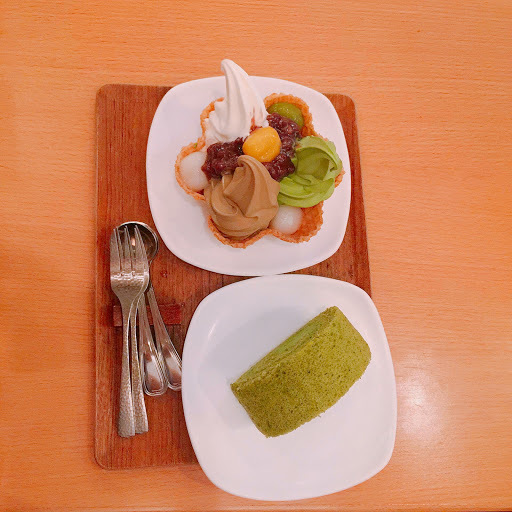 We also went to this tiny cafe called Via Tokyo and tried some ice cream. It was very good. Besides the usual matcha flavor, we got some that I personally haven’t tried before. The black sesame was my favorite. I would definitely buy it again. I really enjoyed it. It was a good cap to our last day. Hey Coleen! I visited Hong Kong Disneyland last summer and it was a lot of fun – much better than the one here in California (lines are so long). I only got to visit Hong Kong for a day which was disappointing but next time I go, I'll be sure to visit some of the places you mentioned here. 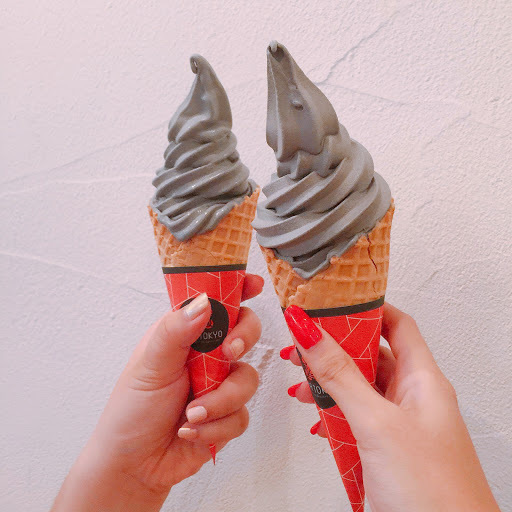 Also, crazy that the dark ice cream was actually black sesame flavored because I thought it was like the ones everyone is instagraming now – activated charcoal ice cream. Anyway, thanks for sharing about your trip!